Corn, or Maize, is indigenous and was first cultivated in Central Mexico and Central America. It is the most widely grown grain crop in the Americas today. The seeds which are called kernels are technically a grain. Feed maize is used for animal consumption as well as a relatively cheap home heating and ethanol bio fuel production. What's called sweet corn is cultivated for human consumption. Maize first spread to Europe and other parts of the world through European traders and explorers in the late 15th and 16th centuries. It adapts well and can be grown in various climates which made it spread worldwide. While we ate corn on the cob, cooked with the kernels, made popcorn and used corn starch as a thickener, we never used cornmeal or corn flour for baking breads. After all we are speaking of the Levant, the home of wheat, and being of an Indian background, the rice grain was the most important staple in our diet. I find it fascinating how indigenous grains influenced regional, sub continent and entire continents' culinary development. Corn was domesticated and cultivated in the Americas. Wheat was domesticated in the Levant and eventually cultivated in North Africa, with archeological evidence showing Egypt being the first developer of bread and yeast fermentation. Lastly rice is believed to have been domesticated in the Yangtze River region in China and became an important dietary staple in the Indian subcontinent and Asia proper. Lora, Nelly and truly yours launched the Breaking Bread Society last month with the Inauguration post, focaccia. We had an overwhelming response with over 30 bakers breaking bread with us in May. If you would like to learn more about Breaking Bread Society you can read all about it here. Whether you bake along with us every month or just once, we want to inspire you to love baking your own bread one loaf at a time. We encourage you to make the recipe your own. Check out Marnely and Lora's recipe ideas for inspiration. Be creative and add your own touch or bake it as we did. Read all about our Breaking Bread Society adventures and let’s unite in #breakingbread together. When Marnely picked this recipe, I was excited, as it intrigued me to use corn meal and flour as raw ingredients, as they are somewhat a mystery to me. While I am on a perpetual search as you can see in my Good Ole' Ameican BBQ post for the perfect BBQ and buns, I loved adding these corn rolls to my ever growing repertoire. While often I make tortillas with wheat, a familiar ingredient, next I need to tackle corn tortillas. Just like maple syrup and cranberries, corn flour and corn meal are my transformation and my culinary right of passage in America. 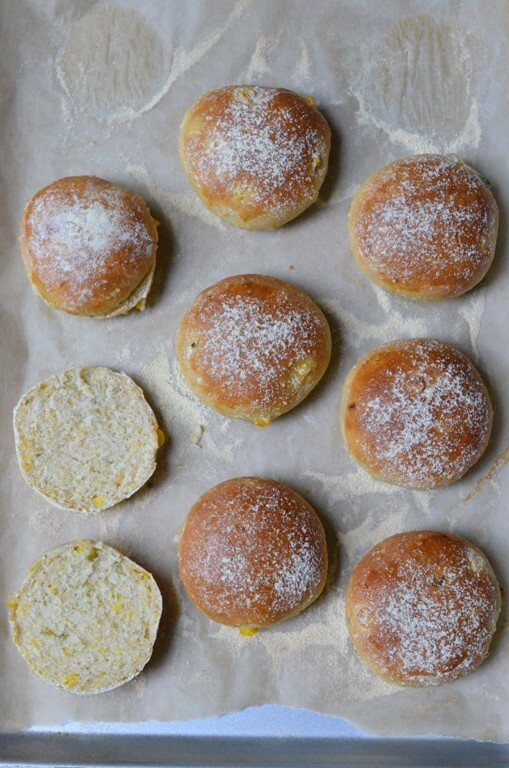 Bake this month’s Corn Rolls and post it on your blog with #BreakingBread in the title of the post by July 1, 2012. Include a link back to the current #BreakingBread hostess Marnely, Cooking with Books blog. Link your post to the linky tool below. It must be a Corn Rolls baked in June 2012. 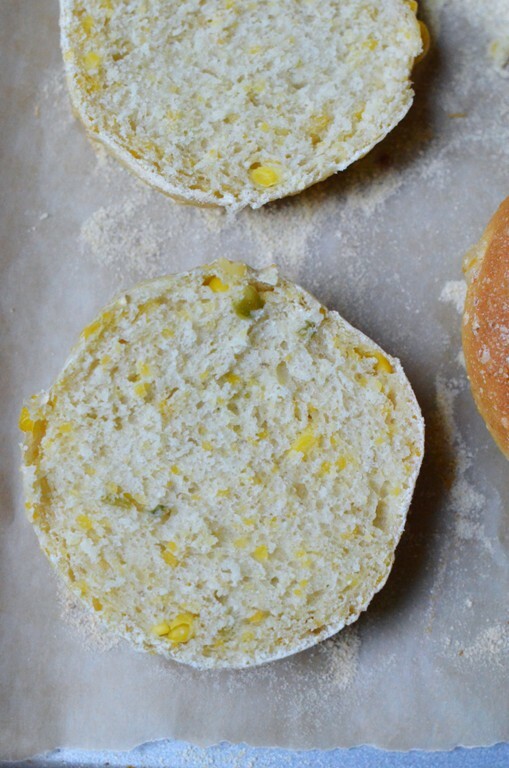 Nelly’s Notes: These are the perfect rolls to showcase fresh summer corn or sweet frozen if fresh isn’t available. A classic recipe that can be served at barbeques and picnics as rolls, or used as vessels for sliders! Make them your own by adding cheeses, herbs, different salts or oils, as well as topping with seeds or more herbs. Make them larger to fit your burgers or make sandwiches. 1. To make corn soaker: put cornmeal in bowl of mixer. Bring ½ of the water to a rolling boil and add to cornmeal. Let sit in mixture for two minutes, and with a paddle, mix for 3 minutes on high speed. Lower speed and add the rest of the water, making sure to scrape bowl. Cover soaker and refrigerate overnight or for a minimum of 8 hours. 2. To make dough: place corn soaker in warm water bath to bring to around 85F. Saute jalapeno in 1 tablespoon oil for few minutes until soft. In mixer fitted with dough hook, place corn soaker and add honey, remaining oil (we used 1 tablespoon to saute jalapeno), and malt. Mix for 1 minute. Add all but 1 ounce of the flour (save this flour if dough needs it or is TOO tacky), as well as all the corn flour, yeast, fresh corn and jalapeno. Lastly, add salt. Mix for 6 minutes on low speed, increase to medium speed for 4 minutes more. Dough should be slightly tacky but have good gluten development. Place in lightly oiled bowl and cover with plastic wrap. Allow to rest and ferment in a warm place for 45-60 minutes. 3. Put dough on lightly floured surface and divide into 2 ounce pieces. Round the dough against tabletop and place them seam-side down on parchment paper lined baking sheet. Cover with plastic wrap. Ferment for 45 minutes to an hour. 4. Preheat oven to 425F. Egg wash rolls and sift cornmeal on top. 5. Transfer rolls to the oven and bake for 15 minutes, rotating trays halfway. Remove from oven and allow to cool on baking pan. *Keep in mind if using water you might need to add much more flour to the dough. Add 1 large heaping tablespoon at the time until you reach a moist supple dough. 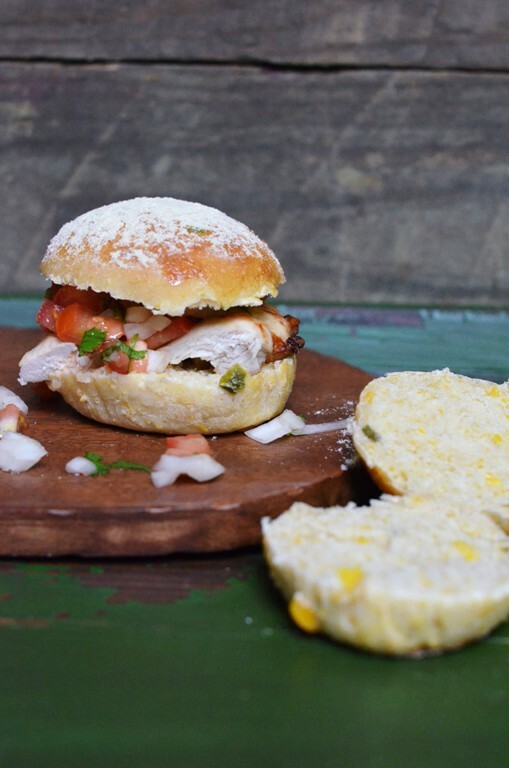 *I served these Fresh Corn and Jalapeno Rolls as mini sliders (the rolls are actually more of a medium size) at a Memorial Day BBQ along with our super simple garlic lime marinated chicken breast, favorite pico de gallo and salsa. You can add guacamole to the mix and you have a great fiesta! Feel free to use your favorite BBQ instead for the sliders. *You can get this recipe in cups and teaspoon measurements at Lora's site. The recipe on this page is as Marnely provided with some adjustments in ingredients and directions. Perfect for a summer BBQ! I can see serving mini black bean burgers on these too. so true Bri. Haven't thought of that but now that you mentioned black bean burgers....it makes complete sense. Can you clarify for me (I keep forgetting) the difference between cornmeal, corn flour, & masa? I'm very intrigued by these! Perfect for turkey sliders, I think. Or pulled BBQ meats. Thx J. When I see Masa I think of corn flour since that how corn flour is labeled in the US but it means dough. I bet someone Spanish will have a better explanation. Corn starch is the white powdery starch extracted from corn used as a thickener in different dishes, I use it in desserts as a thickener. It is also used in ice creams sometimes. Lovely idea! I can already taste Eggs Benedict Mexicana on a split and toasted cheese/corn/jalapeno bun. Everything in those sliders looks fantastic! I loved reading through the history of corn, maize, etc. When my family and I were in France years ago, we asked a local man about the availability of corn on the cob. He thought we were crazy for wanting to eat it because most people there considered that to be food fit for pigs only. These rolls look wonderful and I'd imagine they would make the perfect base for all sorts of sliders. I LOVE these sliders, Shulie. Now I'm regretting not buying extra fresh corn at the farmer's market yesterday. I'm making these for sure...and soon! I have been waiting to see what you are baking this month! These rolls look fabulous! I need to search around quite a bit to find corn flour here but I really want to join you all this month too! I have one single fresh corn sitting in my refrigerator and I am sure if it'll wait till I go corn flour hunting! What gorgeous sliders! The rolls are pefect and look ever so scrumptious. Beautiful sliders, and these rolls are incredible! Shulie I am in love! I can't wait to try these when I get home. The sandwich love that awaits...joy! What an interesting recipe! Love it. I was so happy to participate in May :-) Don't know if I'll be able to this month but I so enjoy following along! These look so perfect for barbecued pork! Very nice. Malt Syrup??? And what a fantastic recipe for Breaking Bread! I love corn bread and I love tossing kernels into almost anything (I have a recipe for corn galettes) - this is great and yours are perfect! wow just reading the title of this bread makes me crave it!!! i love anything corn and bread!! Yum! Love the sliders. Your rolls look so wonderfully light. Such a great idea, I am looking forward to baking along with you all.